When the incredibly low profile and high performance Pirelli P7 CINTURATO ™ came out in the '70s it rocked the world as to the performance that could be expected from a tyre. and when in 1978 Lamborghini fitted the new 345/35ZR15 CINTURATO ™ P7 to it's flag ship model the Countach the world got rocked again, by what was the widest tyre in the world fitted to a production car. The LP400 Countach came fitted with 205/70VR14 front and 215/70VR14 tyres on the rear. However when Pirelli got the incredibly wide 345/35ZR15 P7 CINTURATO ™ tyres homologated to withstand the incredible forces that could be applied to the tyres by the Countach Lamborghini were all to keen to fit them. originally fitting a 205/50ZR15 to the front of the LP400S & the LP5000S. However the LP5000 QV fitted 225/50ZR15 CINTURATO ™ P7. 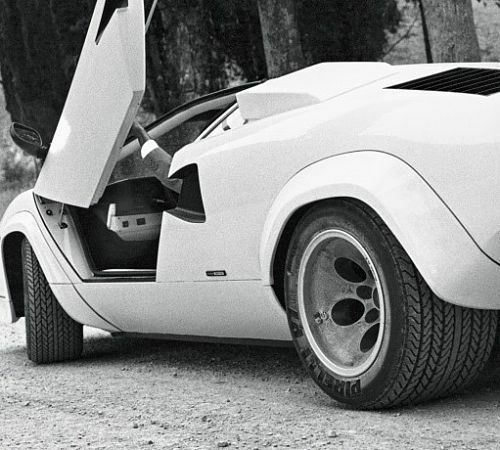 When the Countach moved on to the 25th Anniversary model, they continued to fit the tyre size 225/50ZR15 P-Zero front and 345/35ZR15 P-Zero on the rear, however now the used the asymmetric Pirelli P-Zero Asimmetrico tyres. The Overall Diameter of the 345/35 ZR 15 Pirelli P-Zero Asimmetrico is 632 mm and the width is 350 mm. For more information on the 345/35 ZR 15 Pirelli P-Zero Asimmetrico please see below or call +44 (0) 1302 711 123.